Wireless InSite® is a suite of ray-tracing models and high-fidelity EM solvers for the analysis of site-specific radio wave propagation and wireless communication systems. The RF propagation software provides efficient and accurate predictions of EM propagation and communication channel characteristics in complex urban, indoor, rural and mixed path environments. Wireless InSite provides RF engineers with the tools to design wireless links, optimize antenna coverage, and assess key channel and signal characteristics for RF and millimeter wave frequency bands. Wireless InSite's unique collection of features simplifies the analysis of even the most complex and massive propagation problems. X3D Propagation Model X3D is a 3D propagation model with no restrictions on geometry shape or transmitter/receiver height. This accurate model includes reflections, transmissions and diffractions along with atmospheric absorption. Supports frequencies up to 100 GHz. Diffuse Scattering Capture effects of scattering on complex impulse response and received power (including cross-polarization) for mmWave applications. MIMO Beamforming & Spatial Multiplexing The X3D model simulates MIMO antennas for 5G, WiFi and other technologies. Using detailed multipath, it applies MIMO techniques such as beamforming, spatial multiplexing, and diversity to predict key channel metrics for one or more MIMO data streams. Communication Systems Analysis The Communication Systems Analyzer calculates SINR, throughput, theoretical capacity, and bit error rate (BER), giving users the tools they need to visualize and assess device performance for systems with multiple base stations. Fast Ray-Based Methods 2D site-specific propagation models designed for urban and rough terrain applications. 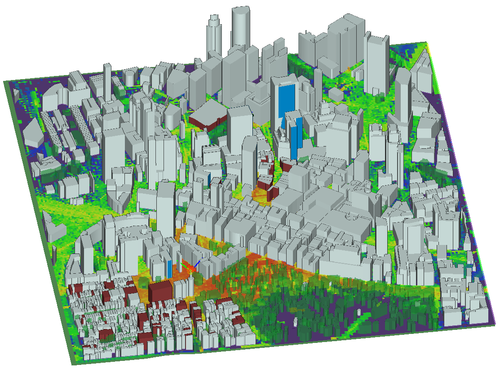 Empirical Propagation Models Suite of empirical models designed for urban and indoor analysis. Feature Import Support for KMZ, COLLADA, SHP, and DXF formats for building and object import. The Geospatial Abstraction Library is used for terrain import in DTED, DEM, and TIFF formats. Antennas Import simulated antennas from XFdtd or create textbook antennas for use in SISO, MIMO and Massive MIMO transmitter and receivers. Materials Electrical properties of the scene can be defined down to the facet level. An installed database of materials includes metal, earth, concrete, brick, wood, glass, etc. at various frequencies. Outputs Users have quick access to outputs such as received power, propagation paths, path loss etc. These ASCII-based files can be plotted in the tool or easily post-processed externally.